Bazna is a small municipality in the Sibiu district, set in the bucolic landscape of the Saxon villages, in the heart of Transylvania. Bazna has given its name to an unusual pig breed, the Bazna pig, once reared by the Saxon population that lived in the area of the Siebenbürgen, the seven towns of Transylvania. They favored the breed for its hardiness and the quality of its fat. During the 19th century, the Bazna breed was crossed first with Mangalica pigs and then with Berkshires, resulting in the pig we know today. The Bazna has black skin and bristles, with a characteristic white band that completely circles the trunk at the height of the shoulders and includes the front legs (similar to the Cinta Senese, a native Tuscan breed). The pig is not particularly large and its head is of average size, with a slightly concave profile. The ears are also of average size, turned forward and positioned horizontally, while the neck is short, wide and thick. The trunk is of average width, fairly large and almost round. The upper line of the body is slightly convex. The back is long and wide, slightly oblique and muscular, while the back legs are well developed but not very thick. 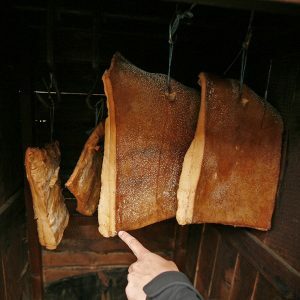 The pork of the Bazna pig has excellent fat, particularly oily, rich in high-density lipoprotein (the so-called “good” cholesterol) and well suited to the production of heavily fat-based cured meats. These are still hung up to age in the attic, where they undergo a light smoking thanks to the double action of special small openings in the chimney, which bring in the smoke, and the permeable roofs of traditional houses, which allow it to escape. Among the various processed products, the cured pork fat stands out for its sweetness, perfect texture and porcelain-white color, with no red parts. The lard is also remarkable (milk-white in color with a clean, meaty scent, a sweet flavor and just the right level of unctuousness), as are the bacon and pork rinds. Unfortunately the majority of the producers in the region have not dedicated much attention to preserving the purity of the breed, and the genetic characteristics have gradually been lost, following numerous crosses with other breeds of pigs, or with the many wild boars in the area. 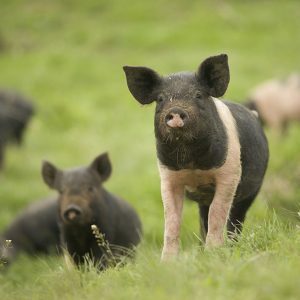 Apart from this loss in the genetic make-up, there is also the fact that the nature of the Bazna pig means it cannot be kept enclosed, making it incompatible with industrial farming. For this reason it is gradually disappearing, along with small-scale subsistence agriculture in general. The Presidium will work together with the Adept Foundation and the newly formed as- sociation of Bazna pig producers to draw up a production protocol that will protect the quality of the processed products, and help get these products onto the local, national and international market. 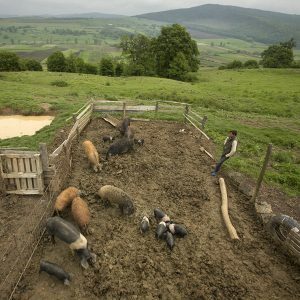 The ultimate aim is to revive the farming of the pure-bred Bazna pig, guaranteeing adequate standards of animal welfare and contributing to the sustainable development of the community. 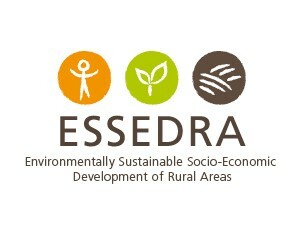 The Presidium is one of the activities of the ESSEDRA project, co-funded by the European Union through DG NEAR and promoted by Slow Food with the aim of facilitating the integration process of the Balkan countries and Turkey into Europe through a strengthen- ing of civil society and its capacity to influence policies and promote sustainable rural development models. 16 producers, veterinarians and academics are united in the association of Bazna pig producers.